Imphal, September 20 2010: Nobap has bagged the maximum number of awards including the best film award in the 7th Manipur State Film Festival which concluded today at the auditorium of Manipur Film Development Corporation (MFDC) Limited. Life time achievement award was conferred on Padmasree Aribam Syam Sharma. The film festival which began on September 11 was organised by MFDC Limited. Nobap produced under the banner of the Second Millennium Mongoloids walked away with the lion's share of the awards on offer including best story, best screenplay writer, best cinematography, best audiography, best editing, best art direction, best male playback singer, special jury award and the best feature film award. Manda won the best actress award for her role in the film Kaboklei. The special jury award was shared between Ima Indu and Abenao for their roles in the films Basantagee Nongallamdai and Nobap respectively. The award for best supporting actress went to L Seema for her role in Naoshum while Gokul won the best supporting actor award for his role in Bomb Blast. 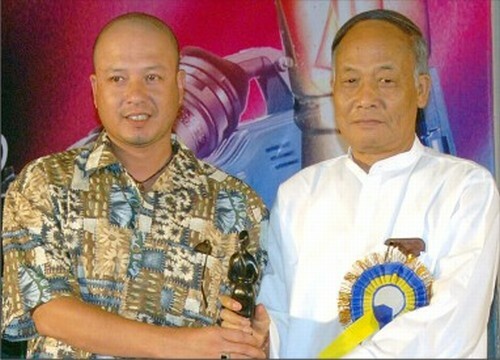 Best audiography, best lyrics and best music direction awards were collected by Ningthouja Lancha's Mami Sami. In non-feature film category, Haobam Pawankumar's Mr India was adjudged the best non-feature documentary film. Boby Wahengbam's documentary film Roshni was selected for the best social issue award. My Cousin Village produced and directed by Saikhom Ratan and B Sanzu bagged best editing, special jury award, best non feature short story film award and best music director award. Menaka Thiyam's Cheng Khujok Ama won the best short film award. Chief Minister O Ibobi gave away the awards in a glittering function today at the MFDC auditorium. The closing function was presided by Art and Culture Director RK Nimai. Addressing the function, Ibobi stated that the Goverment has been seriously considering extension of incentives and rewards to young film artistes of the State. He also underlined the importance of including films made in other dialects of Manipur in addition to Meiteilon in the State film festivals. The Govt has been deliberating on setting up a film city in the State besides making due efforts to frame a State film policy, the Chief Minister stated. RK Nimai called upon film makers of the State to concentrate on producing quality films.